When I started writing my first book in 2009, my initial approach was to block out 4-5 consecutive hours (or even more) for writing. I figured these big blocks of uninterrupted time would help me make progress quickly. However, after more than ten of these sessions, there was hardly anything of value to show for all my time and effort. It was extremely frustrating and confusing. “Why is writing so hard? !” I complained to myself one day. The following week, I shared my literary struggles with one of my mentors- a man who had written a couple of books. We talked about my approach, and he helped me realize that I was making a deadly mistake: trying to research, write, and edit at the same time. Instead of approaching each of these distinct tasks separately, I had been bouncing back and forth between them like a pinball during each of my writing blocks. While this writing approach might seem harmless, it was terribly unproductive. Researching, writing, and editing all contribute to the same deliverable (i.e. a book or article). However, they are separate tasks. Approaching each of them one at a time leads to faster, better results than constantly switching back and forth between them. Once I started doing each of these activities individually, it was amazing how much faster I was able to create great content. There is a key lesson here that applies to virtually any type of work, not just writing. As written here, multitasking is the worst (and most common) work habit in today’s workplace. If you try to do two or more tasks at the same time (i.e. have a conversation with someone while you respond to emails), your performance will suffer. Multitasking makes you slower, less productive, and more likely to make errors. Maybe you already know that. Maybe you are diligent about doing unrelated tasks separately. Even so, it’s still easy to get sucked into the trap of trying to do related tasks at the same time. I refer to this as invisible multitasking. My previous writing approach is one example of this kind of behavior. Invisible multitasking is a byproduct of inaccurately thinking about a “project” as a “task.” That was my mistake during my early writing sessions for my first book. In reality, writing a book (or an article) is not a “task.” Writing a book (or an article) is a “project” that is composed of a number of distinct tasks. As another example, “preparing a presentation” is also not a task. Neither is “doing business development.” Both are projects that are composed of many different tasks. Approaching any of these projects as if they are tasks is a recipe for feeling overwhelmed, for procrastinating, and for invisible multitasking. How often are you invisible multitasking? One way you can tell how often you are invisible multitasking is by looking at the way you plan your day. 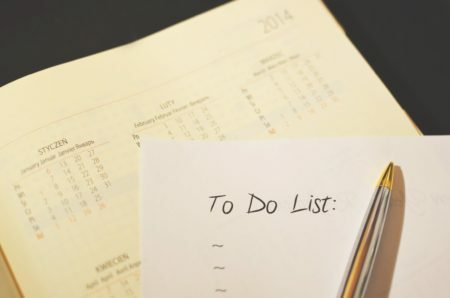 If you typically work off a to-do list that just includes items (projects) like “prepare for presentation” or “make sales calls” or “write article,” chances are that you are invisible multitasking for most or all of the day. If you don’t plan your day at all, it’s even more likely that you are losing a lot of time and energy each day from invisible multitasking. Many people think they are focusing on one task, when they are actually bouncing from task to task within one project. That was the case for me earlier in my writing career. This form of multitasking (which I refer to as invisible multitasking) can be just as deadly for your productivity as more obvious forms of multitasking- like going through emails while speaking to someone in your office. Don’t fall into this common trap. Break down projects into tasks. Then, be as specific as possible about the task that you will work on at any given time, and stay focused on that task until you finish it or take a break. When you are laser-focused on one task at a time (rather than scattered on multiple tasks within one project), you will be amazed at how much more productive you will be, how much clearer your thinking will be, and how much calmer you will be. That has been my experience, and it can happen for you, too.